We’re excited to announce our HOM Back-to-School Sponsorship Challenge! Our very sincere congratulations are extended to Pastor Profaite Medeus, the lead Pastor of Cite Soleil church, on his recent nuptials. 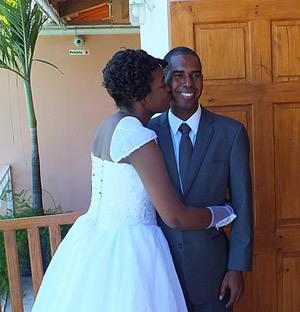 Profaite and Francia were married November 14, 2015 in Francia’s home church with many friends and family and friends in attendance. We wish them both many years of happiness. education in a Christian environment under the same outstanding leadership of Jacky Dorleans, superintendent of our schools. Plans for the Baryé Fé campus includes classrooms for 7th through 13th grades and a trade school. For teams who have been our guests on the Terre Noire campus, undoubtedly you have enjoyed the improvements we’ve made in the guesthouse. Air conditioning is certainly appreciated after a long day’s work as are the smaller, more private dorm rooms and extended covered 3rd floor roof. Most will also agree that more improvements (another bathroom) would be welcome! Although we have managed to accomplish a lot in the last few years, to continue to make needed improvements and to maintain the guesthouse, we need more funds. After much thought and discussion by our HOM and MICECC leaders, we have agreed that it has become necessary to increase the guesthouse fees to $40 per person per day. We have also re-evaluated our practice of offering free tap taps for all or part of the week depending on team size. At one time we had the option of using our van and a staff person to transport teams thus incurring little cost. As we now host multiple teams per week, the van is often not available or not adequate and we have to hire tap taps and guides or translators at a cost to the ministry. We regret that we can no longer afford to offer those discounts. In consideration of the effort and costs to teams participating in a mission trip, we have “bundled” all the related costs for transportation and translators so there is a single fee per team, based on team size. The new fee schedule includes all costs for on-ground transportation including 1 site seeing trip and does include translator(s). For some teams, additional translators may be needed – medical, VBS, etc. – costs for additional translators is still $20 per day. The new fee structure will take effect January 1, 2016. This is the first increase we have had since shortly after the Guesthouse opened and one we feel is necessary to offer comfortable and safe accommodations and transportation for the number of teams that serve with us. Thank you for understanding and we look forward to seeing you in 2016! 2016 GUEST HOUSE FEES: Includes breakfast and dinner, laundry, all ground transportation including airport pickup/return, transportation to and from the work sites (work day 7 am – 5 pm), travel to all HOM/MICECC campuses, a trip to a grocery store and a trip to a beach, Port Au Prince or the mountains. Please note that these fees do not include off site meals, project supplies, and entrance fees to the beaches (meals not included) or to the museums. The team fee includes one trip to either the beaches, Baptist Mission, Port Au Prince, Crois de Bouquet (metal village), National Museum or the Overlook. If a team wishes to explore destinations located farther from our campuses, additional costs will apply. Optional opportunities for site seeing and after hour activities are only available if deemed safe and appropriate by our Haitian leaders. The team fee does not include entrance fees or off site meals. Some of the more popular trips and the additional costs are listed below. If a team wishes to have dinner outside of the Terre Noire Campus; the cost is an additional $15 per tap tap and an additional $5 per guide. Buying dinner for the driver and guide is much appreciated! A second site seeing team trip may be arranged if time and schedules permit, costs to hire one tap tap and one translator for a day (7 a.m. – 5 p.m.) is an additional $85. 2016 FEES FOR TEAMS STAYING OFF CAMPUS – We understand that for some teams, staying off campus may better meet your needs. The costs for ground transportation and translators are the same as outlined above. If the hotel or guesthouse offers airport transportation, deduct $100 for teams smaller than 18 and $200 for teams larger than 18 from the transportation costs. Congratulations to Nadege Gay, daughter of Leon and Jackie Dorleans, on her recent graduation from Salem College with a Bachelor of Arts degree. Several friends and supporters from HOM traveled to Winston Salem to help celebrate her accomplishments. 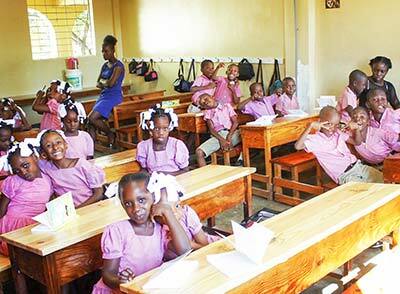 Nadege serves in the schools in Haiti and everyone is excited to welcome her back home. What a joy to share with you the good news about our truck fundraising efforts! The Lord has answered our prayers and provided for a new diesel Toyota pickup truck. Louisa and I would like to take this opportunity say a big thank you to all the friends, families and congregations who donated funds for this effort. We are very touched by your generosity and grateful to blessed to have you as partners in the ministries here in Haiti. It is definitely going to be different for us, knowing we will not have to call the mechanics on a regular basis or stop at the garage a couple times a month as we have been doing. The new truck is going to make our lives much easier especially when it comes to traveling to ministry engagements and meetings as well as carrying out family responsibilities. I must share with you also the joy the Terre-Noire church family has expressed at seeing the new truck since they also were praying for it and contributing toward it. They know that the Pastor’s truck is the main transportation in most ministry-related activities and needs such as group outings and visits, taking people to hospital, youth camp and mission trip, etc. Thank you once again to all of you! Louisa and I pray that the Lord continues to bless all of you, your family, your congregation, and businesses! May He continue to use you as instruments of his love and blessing as we all are committed to serve him and his people! 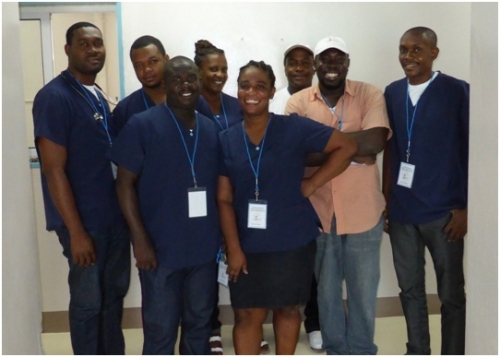 We are pleased to announce that as of September 2014, the Cite Soleil clinic re-opened with a MICECC employed Haitian medical staff to provide care in the Cite Soleil clinic and on our Repatriote campus. Samaritan’s Purse, who partnered with us after the earthquake, left our campus in early August to focus on other areas in Haiti. We are grateful to them for their assistance but are very excited about our new staff. The MICECC clinic, under the leadership of Dr. Etienne Quency, with assistance of Dr. Eric Innocent, 4 nurses and security personnel, will be open Monday through Friday, with shorter days on Tuesday and Thursdays to allow time for community health activities including providing vaccines and patient education. The staff will travel to the Repatriote campus one day a week starting in early January, 2015. We welcome the new staff and this new beginning! We still need HOM volunteer medical and dental teams to supplement the care provided by our staff as well as funds to help pay for medicines and supplies. Please consider joining us in 2015 – there are still many opportunities for you to serve. Contact medtrips@haitioutreachministires for more information about medical or dental missions in Haiti. If you wish to make a donation to help support the clinic, just note on the memo line “clinic fund” and send to HOM, P. O. Box 71042 Durham, NC 27722. 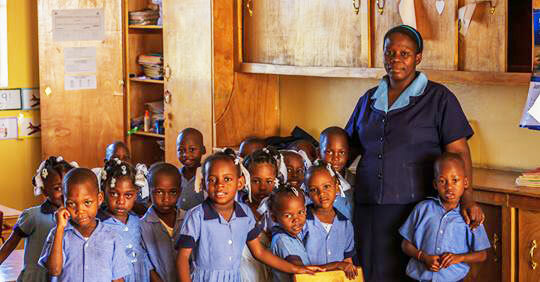 Haiti Outreach Ministries is a great name; it conveys that our ministry’s focus is to reach out to the people of Haiti. You will often see it abbreviated to HOM, and that was our first choice for a web site name. Unfortunately, when we set up the web site, HOM was already in use by another organization. For several years we’ve used the full title for our web site and email addresses for staff and volunteers. After hearing from our many friends and supporters, and with the advice of experts, we are shortening the web site name to make it easier for you to get in touch or find us on the web. We are still Haiti Outreach Ministries, but now you can reach us at www.HaitiOM.org. In the next few months, we will transition to the same abbreviated name for all email addresses. Watch the “What’s New” page for more information on email address changes. 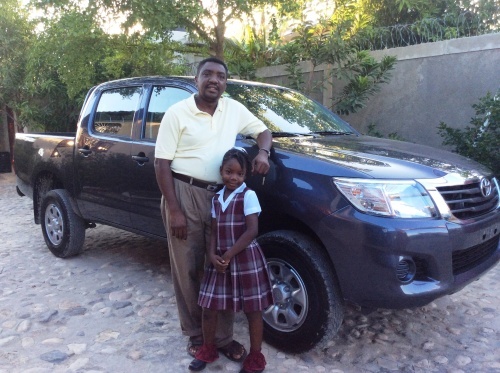 Exciting Changes for Haiti Outreach Ministries and our Donors! In the last year you may have noticed a change in the way our web site looks and works. We’ve added more photos, more information and hopefully made it easier to find what you are looking for. The next step is to improve how we handle donations and communicate with our donors. Starting April 01, 2014, donors can set up an account on-line though the Haiti Outreach Ministries “Donate Now” web page (the big blue button on the top of the page). Once the account is established, you can view your gift giving history, change your donation preferences or payment options, get electronic acknowledgements and make payments by credit card. You can also choose how to receive information from us and make changes to your account. It only takes a few minutes to set up your account and is very easy to do. Click here to go to the Donation FAQs on our home page to read more about the on-line system for donations and to set up your account. 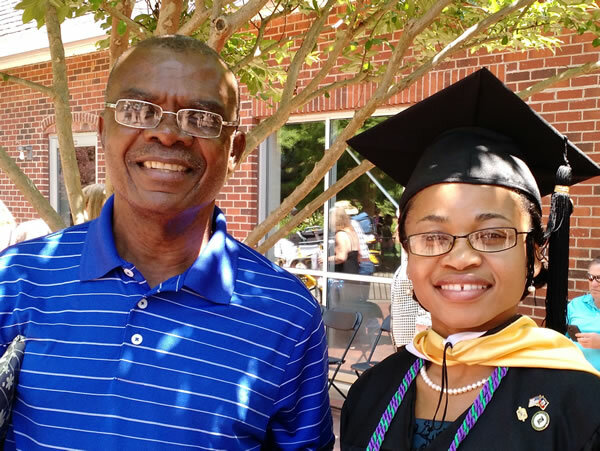 Want to sponsor a student? After you complete the application form on the Donate Now page, you can choose a child to sponsor or click on the appropriate mission project box to make a donation. Once we receive your payment, additional information about your sponsor child will be sent to you. Click here for more information about our Sponsorship Program. We believe in fiscal transparency. You can take a look at our audit or examine our IRS Form 990 on Guidestar. Click on the logo to review our Gold Star rating. Copyright Haiti Outreach Ministries © 2016. All Rights Reserved.